Ladies and gentlemen, this is your captain speaking. We have a small problem. All four engines have stopped. We are doing our damnedest to get them under control. I trust you are not in too much distress. The date was 24 June 1982, and Moody’s 747 was south of Java, en route from Heathrow to Auckland, amidst an ash cloud from Mount Galunggung in Indonesia. At first it looked as if the only hope was to ditch the plane in the ocean. However, the crew was able to glide the plane (let’s all nod now to engineers who managed to create a jumbo jet that descends only one meter for every 15 flown without power) until successfully restarting three of the four engines, but the damage from the cloud made for a harrowing landing over the mountainous terrain around Jakarta. In 1989, another 747 temporarily lost use of all four engines due to a volcanic plume (from Alaska’s Mt. Redoubt). Not surprisingly, since the British Airways incident, volcanic plumes—previously studied more closely for their climatic effects—have become a preoccupation of weather forecasters. The world meteorological and aviation communities have collaborated on the International Airways Volcano Watch, whose advisories Thursday led to the cancellation of flights across northern Europe due to the eruption of Iceland’s Eyjafjalla volcano. It will be hard to overstate the consequence of this eruption for travelers around the world; it is already being compared to the no-fly days after 9/11. 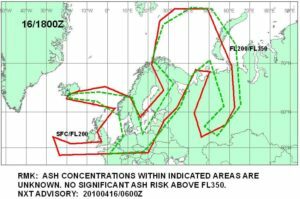 UK Met Office volcanic plume forecast for 1800Z on 16 April 2010. Note the fine print about the height of the plume: no risk above 35,000 feet. 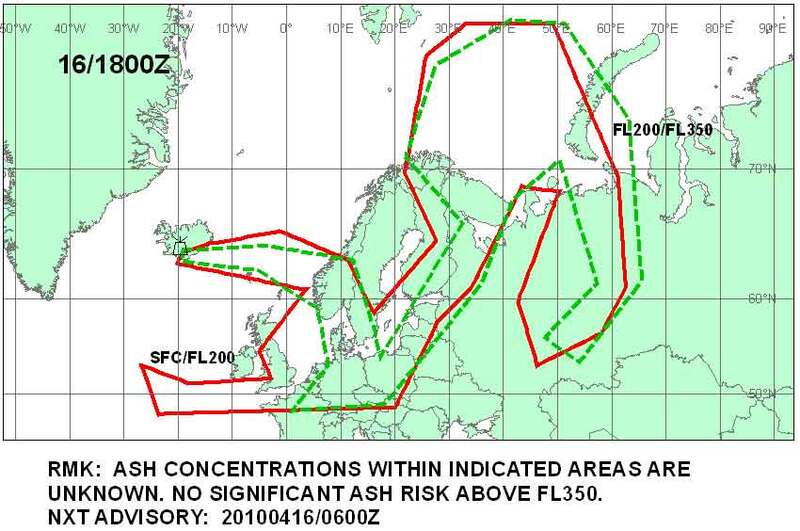 The UK Met office shows the anticipated spread of the ash cloud. Readers interested in how meteorologists detect and analyze volcanic plumes (mostly with satellite ) will want to check out the article on IAVW in the February 2007 issue of Weather and Forecasting by Tupper et al. 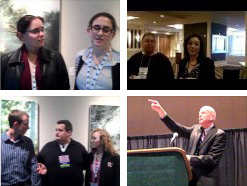 Also in 2007, BAMS published a cover article by Mesikalski et al. previewing some potential improvements in the use of satellite technology for aviation safety, including avoidance of volcanic ash. A quick search of AMS journal articles shows other contributions on weather forecasting and climate topics related to volcano eruptions. Most commentators meanwhile seem to be heading off the inevitable rampant speculation about the climatic effects of the Iceland eruption. Cliff Mass of the University of Washington discusses the relatively small size of the eruption so far (the length of the eruption being a key unknown factor). However, Jeff Masters in his Wunderground blog gives an explanation for why high-latitude volcanoes don’t tend to cool the climate as well as tropical volcanoes. To sum up the Masters’ logic: the atmospheric circulation won’t encourage lofting and spreading of the plume as it would over the tropics, where volcanic gases are pumped high into the stratosphere, causing formation of sulfates in addition to the original volcanic ash(which is heavier and eventually settles out) and then spreading toward midlatitudes. Various conflicting reports about the height of the Icelandic plume can be found–here’s another meteorologist supporting Masters’ contention that the height of the Iceland plume is so far not enough to be a major climatic factor.